McNeel welcomes Long Nguyen, a research associate at ICD Stuttgart, for a 3-day Advanced Workshop for Developers at McNeel Europe in Barcelona. 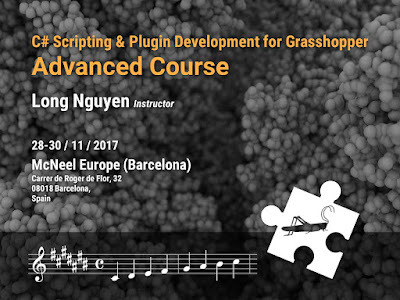 This 3-day advanced course will focus on advanced aspects of C# scripting and plu-gin programming for Grasshopper. In addition to going in-depth with Rhino geometries, custom graphics display and Rhino-Grasshopper interaction, we will learn different techniques to vastly improve code performance and significantly speed up execution time (including using multithread parallel computing). The participants will also have the opportunity to kick-start the development of their own personal projects under the instructor’s guidance. Course Fee: EUR 795 (+VAT); full-time students and university teachers will get a 50% discount (proof of status required). Bookings will be formalized once payment is cleared. Max. Number of Participants: 10. If there is no quorum, the course will be cancelled 15 days before. What are the pre-requisites? No C# experience here and wondering if it would be too advanced. Hi Vakaris Vaitkūnas, the course requires basic knowledge of C# scripting in Grasshopper already and some experience with Visual Studio. Are there computers with the needed software or you have to bring your own laptops?